BRAMPTON, ON – The Worcester Railers HC (19-18-3-3, 43pts) kicked off a three game Canada road trip with a 5-4 shootout loss to the host Brampton Beast (21-18-3-1, 46pts) in front of 5,020 fans at the CAA Centre on Wednesday morning. The Railers continue their three game Canada road swing with games Friday and Saturday night in St. John’s NFLD vs. the Growlers. Ivan Kosorenkov, Tyler Barnes (2-1-3), and Ryan MacKinnon all scored for Worcester while Mitch Gillam made 27 saves in net in the shootout loss. Four different players scored for the Beast and goaltender Jake Paterson made 30 saves in net in the win as Worcester fell to 7-11-0-2 on the road this season. 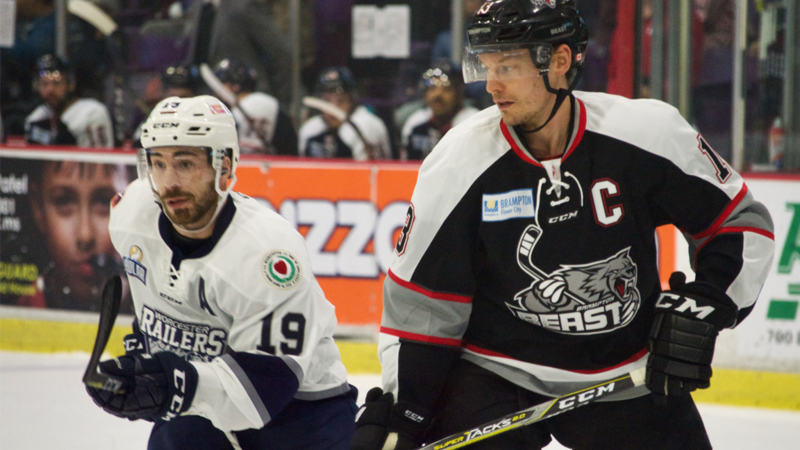 Worcester trailed 1-0 and 2-1 before leading 4-2 but the Beast battled back to force overtime. With the shootout loss, Worcester now trails the Manchester Monarchs by two points for the final playoff spot in the North Division. Worcester trailed 1-0, 2-1, before grabbing a 3-2 lead through 20 minutes of play. Ivan Kosorenkov (7th) tied the score at 1-1 at 6:29 and Tyler Barnes (13th) tied the score at 2-2 at 16:51. The Railers went ahead 3-2 in the final minute of the opening frame as Tyler Barnes fed Ryan MacKinnon (4th) who rushed down the middle and finished a great forehand backhand move past Jake Paterson to give Worcester a 3-2 lead after 20 minutes of play. Jordan Henry (13th) and Jackson Leef (8th) scored for the Beast while Worcester held a 15-10 shot advantage in the first period. Tyler Barnes (14th) gave the Railers a 4-2 advantage with a great ring-a-round-the-rosy score with great puck possession and a quick snap shot from 40 feet at 5:04. Brampton got the score back as Daniel Ciampini (10th) slammed home a backdoor feed into an empty net after a long shift in the Worcester zone at 10:14. Worcester took a 4-3 lead into the second intermission and held a 25-17 shot advantage through 40 minutes. It looked like the Railers were going to win the game in regulation, but the Beast would tie the score with the extra-attacker with under a minute remaining as David Vallorani (13th) deflected a shot through Mitch Gillam at 19:24 to tie the score at 4-4. The overtime period was wide open with both teams having several chances to win the game in the 3-on-3 session. Ivan Kosorenkov scored the only goal in the shootout for the Railers while Nathan Todd and Artur Tianulin struck for the Beast to give them the 5-4 shootout home win. Notes: Three Stars: 3rd star: David Vallorani (1-1-2) 2nd star: Tyler Barnes (2-1-3) 1st star: Artur Tianulin (0-1-1, Shootout Winner) …. final shots were 34-32 in favor of Worcester…. Jake Paterson (6-9-1) made 30 saves on 34 shots for Brampton.…. Mitch Gillam (12-12-1) made 27 saves on 31 shots for Worcester while Evan Buitenhuis was the backup….Worcester went 1-for-1 on the power play while Brampton went 1-for-6…. Kyle McKenzie (inj), Tommy Kelley, Yanick Turcotte, Tyler Mueller (inj), and Malcolm Gould (inj) did not dress for Worcester…. Jeff Kubiak is on recall with the Bridgeport Sound Tigers… the Railers are now 7-3-1-1 all-time vs the Beast… Tyler Barnes now has a four-game point streak (3-3-6)….the Railers scored their first power play goal in seven games (Jan 6)….Worcester has allowed a power play goal in five straight games….the Railers are now 2-3 in the shootout this season….Ryan Hitchcock added two assists and a game high six shots. On Friday and Saturday, the Railers battle the Growlers in St. John’s NFD with both games starting at 5:30pm (ET). Coverage begins at 5:05pm on 98.9 NASH Icon.